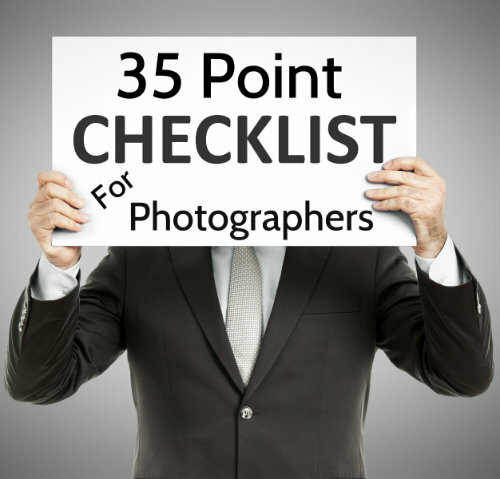 35 Point Checklist For Your Photography Business – Do You Have These Things In Place? I created this simple 35 point checklist for Photographers in a matter of minutes. I simply started typing a list of things that quickly came to mind that can help both new and established photographers. There is no way that you can manage every point effectively because it's so many things to consider. The list is meant to be a checklist for you as you grow your photography business or a reminder for established photographers of things they may want to get to. For example, I am NOT currently doing YouTube videos, but it's something that I'd like to get to at some point. I can use this list to remind me of that. There are some things on the list that only take a few minutes of your time. There are other things that will be time consuming and take dedication. Blogging, for example, is a time consuming task that takes commitment. However, you could start out blogging just once per week because consistency once per week is better than blogging everyday for one week and not blogging again for 6 months. The list does not include details of how to do everything. Some of it is easy to figure out and other items on the list will take some time to figure out and implement. The key is to have a working list that you can use as a checklist for your photography business. So feel free to bookmark this page, email it to yourself or print it out. Finally, this list is by no means all inclusive. I didn't include things like hire an account, get business insurance, buy Quickbooks and much more. If you think another photographer may enjoy this list, please use the social icons below to SHARE IT.